When experience matters, trust over 50 years of plumbing & HVAC service excellence! Call (206) 654-4990 to get the very best in Seattle and King County for general and emergency plumbing, heating and cooling/AC, sewer and water line repair or installation, water heaters, furnaces and more! As your local plumber in Seattle for over 50 years, you can rest easy knowing that you’re getting the highest quality service possible. From everyday plumbing to sewer repair, water line installs to tankless water heaters, and all of your furnace, AC & HVAC needs, Fox Plumbing & Heating is the answer. Since 1964, we've been serving Bellevue, Kirkland, Kent, Renton, Sammamish, Issaquah, Des Moines, Burien, Mercer Island and all communities in King County. We take the stress out of finding a reliable professional plumber or HVAC technician by providing our customers with premium service on every call, just ask around! Fox is proud to be the most trusted, local and premium plumbing, heating, and cooling company in Seattle for all your needs- big and small. What Is The Fox Difference? Fox Plumbing & Heating is dedicated to our customers and to our local Seattle community. Our friends, family, and neighbors have relied on Fox Plumbing & Heating for all their home plumbing, heating and cooling needs since 1964, all around areas like Renton, Bellevue, Mercer Island and Burien. We appreciate our customer feedback! It is so convenient to call one place when you need service for both plumbing and heating. I had a leaky faucet and needed my furnace serviced, both were taken care in one day after the initial visit to assess all my needs. During this visit, I was given an explanation of what all needed to be done to make all the repairs with an estimate. All work was completed as specified and in a professional and timely manner. I was very impressed and satisfied with the service and plan on using Fox in the future. Thank you! The Right Plumbing Company for the Job! Our plumbing experts have been servicing Seattle, Kent, Bellevue, and all of King County for over 50 years when it comes to all your routine and emergency plumbing needs. We offer drain cleaning, sewer repair, and waterline service, as well as we services for traditional and tankless water heaters. Our Heating and Air Conditioning Specialists will keep your home comfortable all year long! We're here to help you with all your heating and AC system needs in the Seattle area. We supply ductless and traditional furnace systems to help keep your home comfortable all year long. Whether your home is too hot or too cold, Fox Plumbing & Heating has the right solution for your home. Contact us for full heating and AC repairs, service and installation. If you ever have a problem with anything we do, we’ll make it right. I personally guarantee it. It is our sincere desire to give all of our customers premium services every time. Treat our customers like our friends and family, and plan on having a lifelong relationship with them. It's no wonder we've been Seattle's answer to plumbing and heating for over 50 years! Fox Plumbing & Heating has been serving Seattle and King County for over 50 years and we’re very excited for the next 50 years! 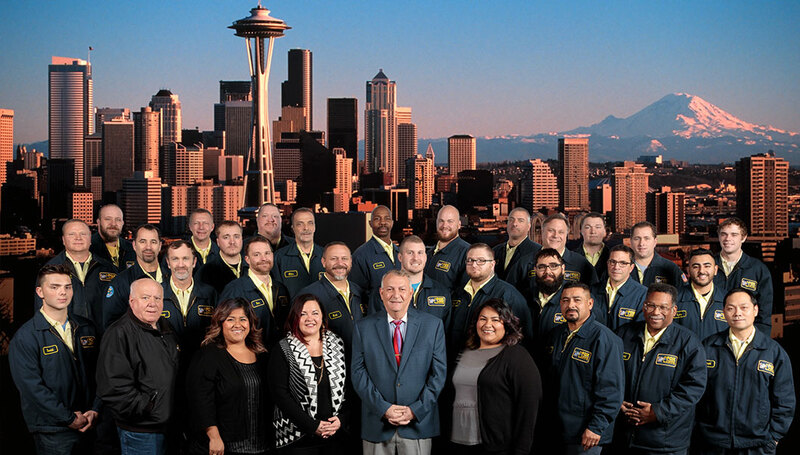 Our professionals have been a part of the Greater Seattle community since 1964 when we began as a small plumbing company in South Seattle. We're very proud of our professional training and the service awards that we've won - and will continue to offer the best in plumbing, sewer, heating, air conditioning and more.